The Anglican Diocese of Adelaide, through our very own Parish of St Augustine’s, is promoting multi cultural church services. “It was an honour to represent the Council and pass on a few words of encouragement to this new congregation in the presence of Bishops, Councillors and Parishioners”. Yes! That is our Mayor doing his Kevin Rudd impersonation and speaking in Mandarin. I am told he did an excellent job. 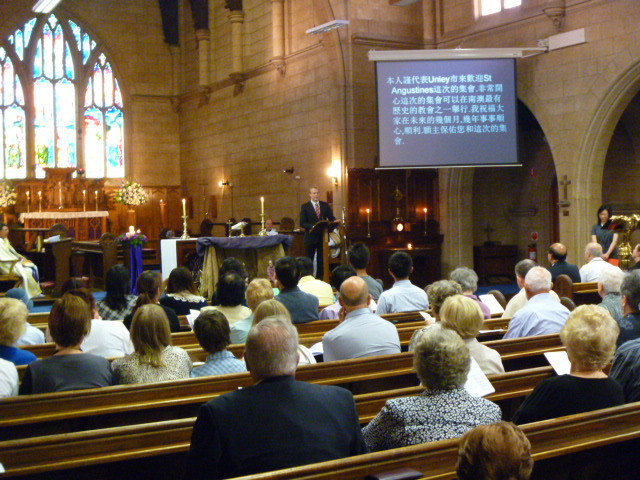 Unley has a growing chinese community and it is great to see their assimilation into our religious community.